Visual Studio 2005 is one the coolest Development Tools available today for developing applications targetting .NET Framework 2.0. In Visual Studio 2005, there have been a lot of changes, compared to the way Windows Applications and Web Applications were created using Visual Studio .NET 2003 and earlier versions. 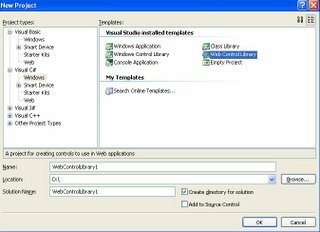 When developing with Visual Studio 2005, we might have noticed that all the web related templates are moved under "File - New - WebSite" option. However, creating a Web Control Library is an exception to this. The Web Control Library Template still lies in the "File - New - Project" Option. It is a little suprising and tricky to find the option to create a Web Control Library. 1. Click "File" - "New Project"
3. Select the preferred language "Visual Basic" or "Visual C#" under "Project Types"
4. Expand the preferred language Node. 5. Select "Windows" under the preferred language Node. 6. The available templates are listed under "Templates"
7. Select the "Web Control Library" and click "Ok" to create a Web Control Library Project. This might be a little suprising since all the Web related projects are moved under "File - New - Website" option whereas the "Web Control Library" still remains here and particularly under "Windows" option. In short, the answer for the question, from my understanding is that, all Project type templates are moved under "File - New - Project" and the Website related ASP.NET Website, ASP.NET WebService are under "File - New - Website" option. Thank you for posting this bit of information. This one helped me to find it. You saved my lot of time. Cant't find it in Visual Studio 2008, what happend with the Web Control Library? Great instructions - it was a mystery! Thanks you very much. Exactly I needed this information. Thanks. It helped me and saved my time for not reinstallation. I was just about to re - install vs 2005, fortunately find this post. Thanks. yes me to i'm looking for a tuto of project web control librery,if somone have a link , please post it , thx a lot . # Thanks for share. i like this article. :) good post bro ..